Lee Forster from Kalgoorlie, has a band called Weirs Crossing. 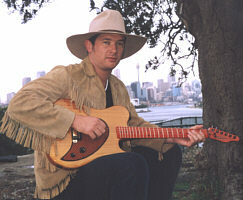 Lee is pictured on the left, in front of the Sydney skyline, holding Mike Moore's guitar. On the right is Lee's own guitar - a Tomkins Diamondtina II.